The First Dire Situation: Man’s feelings dominate his heart and mind and lead them into sin. The feelings of man generally do not show any interest in the future and they prefer one unit of present pleasure to hundreds of units of future pleasure. Yet the heart and mind focus on the future and they oversee the benefits to man, which are either in the past or future, rather than jumping on present pleasures. If anything gives us pleasure now, but may give us pain in the future, the heart and mind – contrary to the feelings – suggest that we abandon it. For example, everybody knows today that smoking is unhealthy, but still there are people who smoke cigarettes. Those whose heart and mind dominate give up smoking considering its harm. Those who are led by their emotions prefer the present pleasure to the future harm and they continue to smoke cigarettes. Western civilization, which has dominated the whole world in the twentieth century, has promoted worldly benefits and pleasures. The excessive media coverage of worldly pleasures and entertainments has naturally directed the attention of people towards these worldly pleasures. Though the Muslims of today have faith in Allah (SWT) and the Judgement day, what leads them to enjoy illicit and haram pleasures is this fact. Today, we can persuade very few of those who have become addicted to the pervasive illicit entertainments to lead an Islamic way of life by proving the existence of Allah (SWT), heaven and hell. Most of them would say “Allah is All Merciful and Compassionate, He is forgiving and hell is far away” and they go on enjoying the haram pleasures which they are addicted to. Their hearts and minds are captivated by their emotions. The Second Dire Situation in this Age: Absolute kufr (atheism) When we examine the Qur’an we see that all the prophets from Adam (peace be upon him) to our Prophet (PBUH) had dealt with idolatrous communities – that is, not those who deny the existence of Allah, rather those who accept Him, but ascribe the idols as partners to Allah. In the same way, we see that people who are atheists have been rare since the Prophet Muhammad (PBUH) in the Islamic communities. The Islamic scholars have dealt mostly not with atheists but with bid’a groups such as Mu’tazila and Shia. However, today what has not been witnessed throughout all history has happened and because of materialist and positivist philosophies, kufr (atheism) has spread. Imam Bediuzzaman relates as follows regarding this issue: “In olden times, deviation caused by absolute kufr, and science and stubbornness caused by purposeful obstinate unbelief were very scarce in comparison to the current time. For that reason, the works and proofs of earlier scholars of Islam were very effective at that time. They used to immediately remove any unbelief caused by random doubts. Since belief in Allah was the general standard, when they would give information about Him and tell of the tortures of hell, many would give up their debauchery, stubbornness and unbelief. Imam reiterates his statements above, expanding them a little more in his book The Letters as follows: “Thirty years ago, Old Said received some fearsome blows to his heedless head. He thought the postulate [اَلْمَوْتُ حَقٌّ ] (The death is truth!). He saw himself sunk in a swamp. He demanded help, sought a way-out and a rescuer. He saw that the paths are various; he hesitated. He randomly opened Futuhu’l Ghayb to see what was written for him (tafa’ul), the book of Ghaws A’zam Shaykh Abdulqadir Jilani (may Allah be pleased with him). It read: [اَنْتَ فِى دَارِ الْحِكْمَةِ فَاطْلُبْ طَبِيبًا يُدَاوِى قَلْبَكَ] (You are in dar al hikmah (place of wisdom), find a physician to cure your heart!) It was surprising that I was a member of Daru’l Hikmatu’l Islamiyya in Istanbul at that time. I was a so-called doctor trying to cure the spiritual wounds of Muslims; however, I had more wounds. The patient first should cure himself and then the others. Thus, the honourable shaykh was saying to me: ‘You are a patient, find a healer for yourself!’ I said: ‘You become my healer!’ I read his book, making myself his addressee, as if the book had been written for me. However, the book was very harsh. It was severely wounding my pride. It carried out a spiritual surgical operation in my soul. I could not stand it; I made myself its addressee only for half of it; I could not tolerate it to the end. I put it in my cupboard. But later the pains caused by spiritual surgical operation went away and I felt a pleasure. I read whole of that book of my first master and benefited very much from it. And, I listened to his wird (dhikr) and munaja’at (supplication) and I felt a great spiritual pleasure. Then I saw the book of Imam Rabbani, Maktubat (The Letters) and held it. I opened it with a sincere tafa’ul. It is very surprising that throughout his whole book there were only two ‘Bediuzzaman’ words. Those two letters were suddenly opened to me. My father’s name is Mirza and I saw that on the beginnings of these letters it was written ‘the letter to Mirza Bediuzzaman. I said ‘fa subhanallah these address to me’. At that time one of nicknames of Old Said was Bediuzzaman and I did not know anybody who had been famous with that nickname except for Bediuzzaman Hamadani who lived third century after Hijra. Yet, it is understood that there was a man in the time of the Imam and he had written those two letters to that man. And his situation resembled mine in that I found those two letters as healing to my wounds. However, the Imam suggests persistently in that letter as he does in many others: “Unite your qibla.” In other words, accept someone as your master and follow him and do not engage with others. This most important recommendation of his did not fit my capability and spiritual condition. I thought a lot: “Should I follow this one, or that one, or the other one?’ I was baffled. Each of them had different attractive features. I could not content myself with only one of them. While I was in this confusion it was inspired to my heart with compassion from Allah (SWT): ‘The beginning of these different paths and the source of these rivers and the sun of these planets is the Qur’an al Hakim (the Wise). This is where you can find your real united qiblah. Thus, the most comprehensive master and the most sacred guide is this.’ I grabbed it. My insufficient and poor capability, of course, could not receive and absorb deservedly the light of that true guide which is like the water of eternity; yet, we can show that light and that water of eternity according to the rank of the man of heart and maturity again with its light.’ Thus, those words and lights coming from the Qur’an are not solely rational academic matters, but the matters of faith related to heart, spirit and maturity and they are in the position of highly valuable Divine ma’rifah. First way: It is through the path of tariqat, experiencing sayr u suluk and passing through the spiritual ranks. Second way: It is reaching the truth directly through the Divine granting of Allah without entering the path of tariqat, which is a short and high path particular to the companions and the tabi’in. Thus, the lights emanating from the truths of the Qur’an and the Words which are interpreters of the lights may have that feature and actually they do.” (The Letters, 28th Letter, 3rd Risala) Similar to the statement of the Imam above about passing from the external realm to the truth, the following statements come in the introduction section of his book titled “Mathnawi”: “Forty or fifty years ago, because Old Said was preoccupied too much with rational disciplines of knowledge and philosophy, he sought a path for attaining the truth of truths like ‘people of tariqat’ and ‘people of haqiqah’. He could not content himself with only engaging with the heart like many of the people of tariqat, because his mind was damaged by philosophy to some extent; he needed curing. Then he wanted to follow some great people of haqiqah who had attained it in terms of both heart and mind. He realized that each of them had a unique attractive characteristic. He felt a confusion about which one he should follow. Imam Rabbani told him, “Unite your qiblah!”, that is, follow only one master! It was inspired to the heart of Old Said who was severely wounded: “The real master is the Qur’an. The unity of qiblah is made possible with this master and in that way, only with the guidance of that sacred master both his heart and spirit began the suluk. His evil commanding soul forced him to a spiritual and academic struggle with its doubts and hesitations. Not by closing his eyes, but like Imam Ghazali (ra), Maulana Jalaladdin (ra) and Imam Rabbani (ra), he travelled with open eyes where the people of istighraq (people spiritually overwhelmed) closed the eyes of their reason (mind). Limitless praises be to Allah that he found a path to the truth through the guidance of the Qur’an and he entered it. He even showed with the writing of the Risale-i Nur by the New Said that he had been the recipient of the fact that [كُلِّ شَيْءٍ لَهُ آيَةٌ تَدُلُّ عَلَى اَنَّهُ وَاحِد وَ فِى] (In everything there is a sign indicating that He is one and unique). The Second Point: Because he achieved union of the heart and mind like Maulana Jalaladdin (ra) and Imam Rabbani (ra) and Imam Ghazali (ra), first of all, he healed the wounds of heart and soul and got rid of the doubts of the evil-commanding soul (nafs) and in that way, lillahilhamd, Old Said was transformed into New Said. 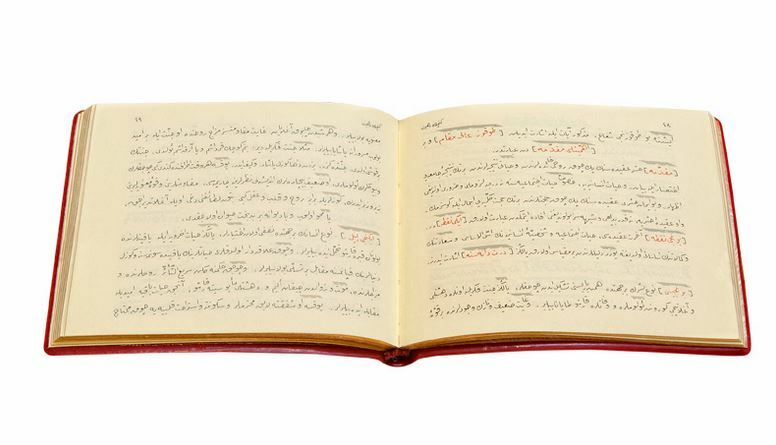 Like the Mathnawi al Sharif which is originally Persian, he also authored Katra, Hubab, Habba, Zuhra, Zarra, Shamma, Shu’la, Lamaa’t, Rashahat, Lasiyyemma and other treatises, a kind of Mathnawi in Arabic, and Point and Flashes in Turkish in a quite brief way and he printed them as and when he found the opportunity. For nearly half a century, his path in the form of the Risale-i Nur, in return for struggling with the nafs and Satan, became a comprehensive and general mathnawi for those who were in confusion and need and in the face of those who go astray dut to following philosophy. The First and most important is direct service to the truths of belief; Imam Rabbani travelled this way in his later years. The Second is service to the religious obligations and Glorious Sunna under the veil of the Sufi way. Some extraordinary situations may be witnessed in the Risale-i Nur just as they may be in tariqats. The Imam says these extraordinary situations and events are not karamat but ikram. He explains the difference between karamat and ikram in the Ninth Letter as follows: “Your success, endeavour, and eagerness in spreading the lights of the Qur’an are a Divine ikram, a wonder of the Qur’an, a Divine favour. I congratulate you. Since we have come to a discussion of karamat (wonder-working), ikram, and favour, I shall tell you the difference between karamat and ikram. It is like this: So long as there is no necessity for it, to display wonder-working is harmful. Whereas to make known ikram is to make known a Divine bounty. If someone who is honoured with karamat knowingly manifests an extraordinary matter, and his evil-commanding soul is persistent, then in respect of him relying on himself and on his soul and what he has uncovered and falling into pride, it may be that Allah (SWT) is drawing him on by at first granting him success. If unknowingly he displays a wondrous act, for example, a person has an unvoiced question and involuntarily he gives an appropriate answer, and afterwards understands, this increases his confidence, not in himself, but in his Sustainer. He says: “I have a Preserver who is raising me better than I myself.” And this increases his reliance on Allah. This is a harmless sort of wonder-working; he is not charged with concealing it, but he should not intentionally display it, because of pride. For since man’s power to act has some connection with it, he may relate it to himself. “It was asked by some people who had been reading diwans (books) of the awliya and books of the scholars: What is the reason for the fact that the pleasure and energy and faith and consciousness that the Risale-i Nur provides are more powerful than those of other books? 1. Most diwans of old blessed people and some treatises of scholars give information about consequences, fruits and pleasures of faith and marifat. In their time there was not an attack on the roots of the faith and the pillars of the faith were not being shaken. But now, there is a fierce collective onslaught on the roots and pillars of faith. 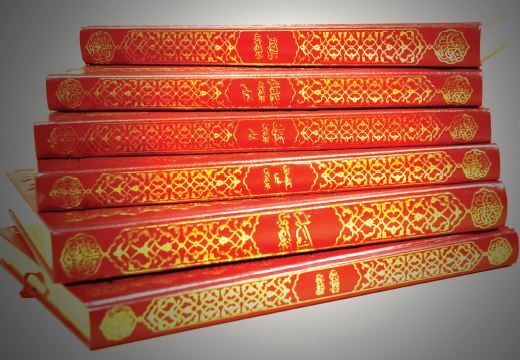 Most of those diwans and treatises are addressed particularly to believers and individuals and they are not able to repel the ferocious attacks of today. 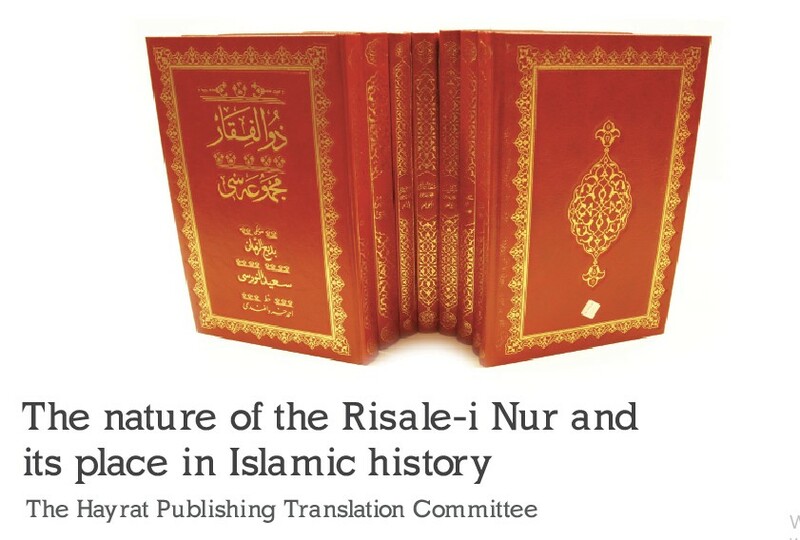 But, the Risale-i Nur, as a semantic miracle of the Qur’an, rescues the pillars of the faith and rather than benefitting from present faith, since it serves proving, verification, protection and saving from doubts of the faith with a lot of proofs and brilliant evidences, those who evaluate it carefully conclude that everybody needs it as they would bread or medicine. 3. The Risale-i Nur first of all tries to persuade the nafs (self) of its author and then engages with others. Of course, an instruction which convinces the nafs al ammara (evil-commanding self) and removes the doubts of its author is quite powerful and sincere that it retaliates on its own in the face of the horrible collective personality of unbelief which has become so widespread in this age.